Since reading Phil Haack’s blog post about using a Fitbit step counter, I felt the need to try one myself. I always enjoy adding a bit of “geek” to any element of my life, and measuring the steps I take, the number of calories I burn and the number of stairs I climb seemed like just the thing. Especially when I spend my entire working day just sitting at a desk. After a few months of procastrinating I finally got a Fitbit One at the beginning of April. As mentioned, the Fitbit One measures the number of steps I take, and how many flights of stairs I climb. This data is then presented in a pleasing manner, either in the app (for iPhone or Android) or on their web site. 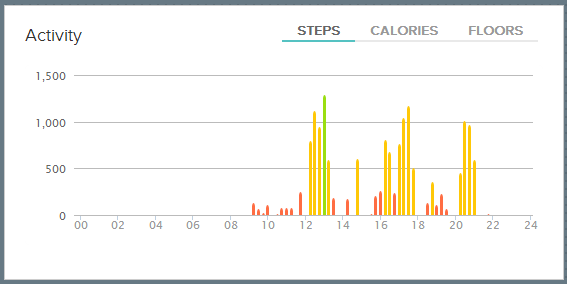 You get colorful graphs such as the one below, which in this case displays the steps I’ve taken on a relatively active day this summer. Recently, I extended my Fitbit family by purchasing a Fitbit Aria scale. It measures my weight and body fat as a percentage and then uploads the data to Fitbit via Wi-Fi. Even if the body fat percentage is less than scientifically accurate, I figure that as long as the discrepancy in its measurements stays constant, I will get an indication of the general “trend”, as it were. Currently I’m averaging somewhere around 50% more steps per day than when I started measuring three months ago, so it’s obviously working! And since I recently convinced my wife to get one, I have added a new dimension of competitiveness to it all. It’s on now!